DaVinci’s Ascent is one of the most well-known personal herbal vaporizers on the market and one look and it is easy to see why. The first thing you notice about the Ascent is its undeniable style. While it is customizable, the basic model comes in a variety of truly sleek finishes—my favorite will always be the burled wood, it is shiny and just classy as all get out. But there is far more to the Ascent than just a pretty package. DaVinci’s Ascent is one of the most well-known personal herbal vaporizers on the market and one look and it is easy to see why. The Ascent has an unparalleled style that makes it a clear standout in the herbal vaping market. The Ascent Bundle comes with everything you need for both loose leaf and oil varieties of vaping and is an excellent device for anyone looking to enjoy herbal vaping. 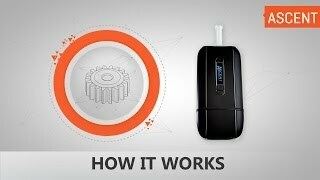 It offers a full glass vapor pass through that gives you the cleanest vaping experience possible. The glass stem pulls out from the device itself for ease of use portability. The power button is on the top right next to the stem. Once powered on the device begins to heat up and when you have reached your desired temperature you are ready to go. The screen will show a little icon that looks like a cup heating up, and that will mean the device is ready for use. With a three-hour battery life this unit rivals and, in most cases exceeds its competitors and provides a longer lasting charge for more vaping pleasure. The ceramic chamber is a perfect companion, holding plenty of dry herb for several vaping sessions. The OLED screen is easy to read, and the three button control allows you to program your temperature, average session times and view your battery life. For me the battery monitor seemed a little inconsistent, mine would show that the battery was dead, when there was still plenty of charges left available, but if you keep track of you vaping time, you can sort of gauge how long it’s been since your last charge, and this shouldn’t be much of a problem. The controls take a little getting used to, at first, so make sure you don’t just toss that user’s manual away, you might want to have it handy until you get a hang of the controls. The bottom of the device swings opens to reveal the chamber, which you can fill either with dry herb, marijuana, tobacco, or you can use one of the included oil jars, for oil extracts and dabs. Once charged, filled, and heated up you are ready to enjoy your vapor. Be careful how finely you grind up your herb, if it is too, fine pieces can either fall out the bottom or even travel up the glass stem. The internal glass stem has three little holes that the vapor travels through from the chamber to the mouthpiece stem. These little holes can easily get clogged after a few uses, so make sure you keep this any other parts of your vaporizer clean, and you will have a more effective vaping experience. The DaVinci Ascent Kit also includes a replacement set of glass stems, 2 of those oil jars, a wall charger, a metal pick, and a carrying bag. The metal pick is another great feature that directly fits in the top of the device. It is perfect for stirring up your bowl, which will be a necessary thing if you want to get the best vapor out of the Ascent. I love that it fits right in the top so that you never lose it like I have every other stirring stick that has come with my pieces and devices. With such amazing style, it’s hard not to love this device. 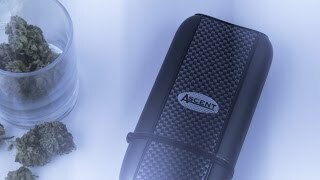 The Ascent feels awesome when you are using it, and the vapor production is some of the best I’ve experienced in the dry herb vaporizer market. That being said, to get that awesome vapor production you must stir the herb in the chamber regularly; this ensures that you get the best possible vapor. When I notice that I have to take extra long hits to get decent vapor, that’s when I know it needs a stir. Luckily, the Ascent comes equipped for that, so I just pull the metal pick out of the top and give the chamber contents a little stir. The battery life is another major plus. With other competitors having battery lives around 1 to 2 hours long, DaVinci’s Ascent powers through 3 full hours of vaping pleasure. Even though the battery icon can be inconsistent, if you keep track of the time you will find that it’s easy to get those three hours too. It does take a long time to charge up the first time, so even though you’re excited, be patient, it’s worth the wait to get a full charge. It also heats up quickly, so there’s never much waiting involved. There is another potential downfall in the size of the chamber. I find the device works best when it’s filled up full, but sometimes I don’t want to have to fill it up that full. Still, I would rather have the option to have it full for when I’m using the device with friends, so this isn’t a deal breaker for me. It is bigger and does weigh more than some of the other models on the market like the PAX or VaporFi’s Stratus, but the extra weight is easily made up for in the style and, of course, the awesome battery life. DaVinci’s Ascent truly does a stellar job as an herbal vape, and it is so cool and stylish it’s hard not to feel cool and stylish when you’re vaping it too. An excellent device that will put a smile on anyone's face. FastTech - Voopoo X217 only $48.99?